Wish you were around today Martha! It seems that your campaign of nearly two decades is finally catching on in India. Many actors and journalists in India are now sharing their stories of sexual harassment in #MeTooIndia! When you began to implement Vishakha Guidelines of Supreme Court in PRIA itself after 1998, many of us men were generally apathetic to it. When you proposed that Governing Board appoint an internal committee to promote awareness and monitor cases of sexual harassment, I felt somewhat threatened. When you demanded in 2000 that all PRIA partners—NGOs, academic institutions and even panchayats—undergo a gender audit as part of due diligence (just like financial audit) requirement for partnership, several NGO leaders thought it was frivolous. In 2003, you arranged to put up formal notices in PRIA offices in Delhi and around the country about “Zero Tolerance for Sexual Harassment”, some participants and visitors thought it was excessive, and seemed to indicate as if sexual harassment was a serious problem in PRIA. In 2008, as a part of political empowerment of women panchayat leaders, you explained to them how the entire village is their workplace, and any sexual harassment anywhere is violation of Supreme Court orders. During the next five years, you trained several thousand women and men in public and private sector businesses, academia, schools and government agencies; we in PRIA, and our partner organisations, perhaps continued to view your work in this regard as marginal to our central pursuit of citizen participation and democratic governance. As you decided to undertake doctoral studies having turned 50, you chose to study sexual harassment. You focused on development NGOs in your field work. You could not find any professor in your university who would guide you academically on this topic. Your literature review turned up barely 2-3 studies in India. You finished your PhD—first ever in India— on this topic months before the parliament enacted Prevention of Sexual Harassment Act in December 2013. Your understanding of sexual harassment—verbal, visual, digital, oral and physical—was comprehensive, and found resonance in the legal definition provided by this new Act. More importantly, you understood the power and control exercised by men in authority to extract sexual favours and continue sexual harassment. And you showed how women kept silent; women kept silent, as you showed then Martha, because they were afraid to lose their job and livelihood. You began to explain why girls were dropping out of high school after puberty because they and their families were afraid of sexual harassment on way to school. You began to appeal to youth—in Haryana—five years ago to ‘break their silence’ and change the way sexual harassment and abuse happens at home, in community, schools and public places. To your call, thousands of youth in Sonepat came forward to ‘break their silence’—much before ‘Beti Bachao’ became a call from the government. But you understood so very clearly, that ‘beta samjhao’ was far more important for ‘beti bachao’ than merely sending the girls to school. It was your deep appreciation of power dynamics at work which resulted in confrontation with men in PRIA, other NGOs and colleges. You understood why women were dropping out from workplaces. Sexual harassment at workplace was one of the main factors causing reduction in female labour force participation in India. In your studies with ILO, you emphasised the training of labour inspectors in this light. In your analysis of several State Commissions of Women, you challenged them to take on this issue, especially for women workers in the informal sectors of economy. Alas, Martha, you are no more to see how you were a pioneer of this movement much before. But, you will be delighted to know Martha that everything you said and did to prevent sexual harassment is now being touted around in the new wave of #MeToo. As I listened to women journalists describe why they kept silent then, every bit of your analysis of power and control by men in authority rings true. As NDTV’s Ravish Kumar today talks about the criticality of awareness programmes for all employees of all workplaces, I recall your frustrations when leaders of NGOs and managers of companies and heads of government departments asked you to just help set up the Internal Complaints Committees, and not bother to waste time in awareness generation of all employees. It was out of this frustration that you designed and launched the first ever online programme on sexual harassment at workplace—in English & Hindi—at PRIA more than five years ago. Dear Martha, I wish you were here with us all today. 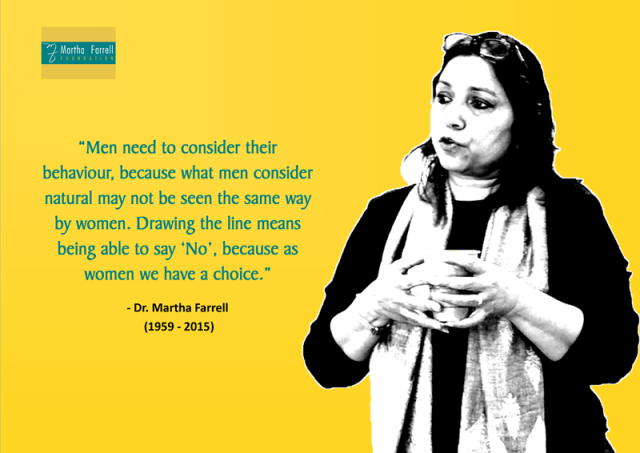 I wish you are able to see that Martha Farrell Foundation set up to advance your legacy (after you were killed in Kabul in a terrorist attack three years ago) is actively working on prevention of sexual harassment at workplace, especially for informal sector workers like domestic maids and construction workers. I wish you were here today, Martha! This entry was posted in Making Workplaces Safe. Bookmark the permalink.